At least 10 major tremors were felt in Tanzania and Kenya between July 12 and 18. Investigations into the tremors, which a geologist described as "ABNORMAL AND STRANGE", will continue. "It is extremely interesting that the quakes are centred near Ol Doinyo Lengai [volcano] but this does not mean it will erupt. The quakes may just be tectonic, indicating movement in the Rift Valley, and do not necessarily mean lava is moving." Reports that the epicentre of the tremors, earlier traced to Lake Natron, Tanzania, some 240km away from Nairobi, could be moving closer to the city caused fear and concern. The earthquakes have also reportedly risen in strength from 4.4 on the Richter Scale last Thursday to 6.1 by 5.10pm on Tuesday. Tuesday's tremors hit in succession within a difference of five seconds. The first - which measured 6.0 on the Richter scale - was felt at 5.10.43pm, followed by a more powerful one at 5.10.50pm. The epicentre of the first tremor was in Tanzania near the Kenyan border, just 145km from Nairobi while the second was some 246km away. The third hit at 9.27.51pm and measured 5.0 on the Richter scale, with the epicentre traced to Tanzania some 185km South South West of Nairobi. In Nairobi, people dashed out of buildings fearing they could collapse, while in Mombasa, the tremors caused ocean turbulence and was experienced by people travelling by ferry. "I felt like my heart missed a beat as the ferry I was in was being rocked by fierce sea waves. There was turbulence in the waters and at one point, I thought we were going to sink." According to a geologist, the tremor shook buildings, power and telephone lines. "This thing is terrible and the members of the public should be careful. We have never witnessed earth tremors persisting for more than a week consecutively in the country." Reports say temporary structures in some areas of the town either caved in or cracked. 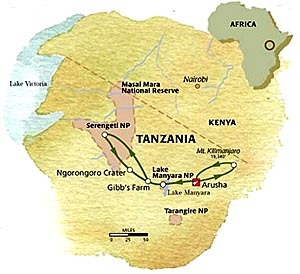 Areas of Maasai Mara game reserve, Loita and most trading centres on the Kenya/Tanzania border experienced long durations of the tremors, spreading panic.